ISPAC 2012 will be held at Rolduc Conference Centre. Follow the A2 motorway in the direction of Maastricht/Heerlen and take the A76 in the direction of Heerlen/Aken (Aachen) at the Kerensheide interchange. At the Ten Esschen junction, follow Kerkrade (A76 and from the Bocholtz interchange, the N281). Take the Kerkrade exit and follow “Kerkrade”. Follow the brown signposts marked “Rolduc”. 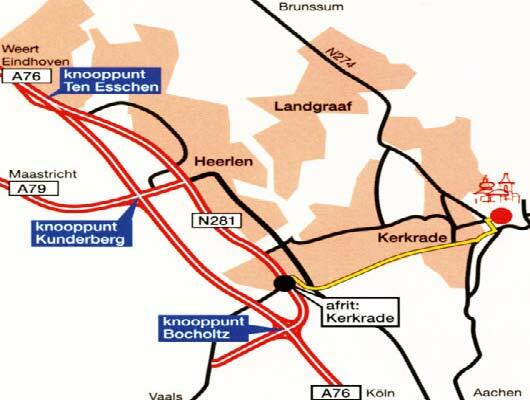 After crossing the border on the Aachen/Heerlen motorway (A4/A76), follow Kerkrade at the Bocholtz interchange (N281). Take the Kerkrade exit and follow “Kerkrade”. Follow the brown signposts marked “Rolduc”. Alight at Kerkrade-Centrum railway station. Take a taxi to Rolduc. Alight at Heerlen railway station, and take a taxi or bus to Rolduc. Alight at Herzogenrath railway station. Take a taxi to Rolduc. Please, click one of the images to download directions information in .pdf format.